We are proud to announce that Wayne Brothers Holding Company, the parent company for WBI and PCS business units, has successfully acquired InteSpec Inc., a process equipment installation company based in Denver, NC. We would like for you to assist us with the transition of ownership, for all their management and construction staff members, by welcoming them into our business family. Please expect to hear more about this exciting event and the execution plan for growing together over 2018 and beyond. Wayne Brothers Holding Company, has acquired InteSpec Inc., of Denver NC a process integration specialist company which concentrates within the Food and Beverage industry sector throughout the US market. Through this transaction Wayne Brothers has increased its presence with industrial contracting service offerings to its multitude of repeat Middle Market and Fortune 500 clients. InteSpec has considerable presence within the food and beverage process equipment installation, piping and controls. The company founded in 2000 by Ken and Mary Ann Fincham, has developed a solid reputation for quality installations and system designs, among beverage bottlers, food paste production manufacturers and others. The company’s project engineers / managers and skilled craft workers excel in their ability to consistently exceed the owner’s quality standards and project timeline requirements. Additionally, Wayne Brothers expects to continue their recent expansion internally of the heavy machinery/equipment installation and rigging business which it currently performs from within its core operations. 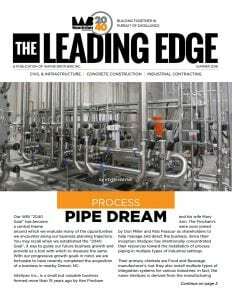 The synergies of our industrial services already provided, combined with the newly acquired process piping / specialty process integration capacity of Intespec, leads us to expect substantial growth opportunities for the combined companies. With the multitude of customers from many of the largest and most respected names in the business world, we will continue the journey towards our goal to be “The Number One Construction Services Team” anywhere within our operational footprint.